Spread bread cubes in 8 x 8-inch pan coated with non-stick spray. In medium bowl, beat eggs until frothy; add sugar, vanilla, cinnamon, butter and milk. Beat until well mixed. Stir in raisins. Pour over bread, pressing bread down until coated; let stand 40 minutes, occasionally pressing bread down to soak. Bake 50 minutes until pudding is browned and puffy. Bring apricot preserves and water to a boil. Cook 1 minute. Add brandy and mix. 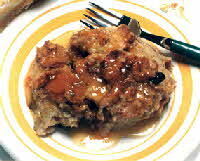 Serve warm over bread pudding. Each serving provides approximately: 365 calories, 7 g protein, 67 g carbohydrates, 1 g fiber, 6 g fat (3 g saturated), 55 mg cholesterol, 49 mcg folate, 3 mg iron, 407 mg sodium.